A sparkling blend of lime, mint, rose & cacao. For a naturally light highball or to enjoy soft. No artificial flavourings, sweeteners or preservatives. 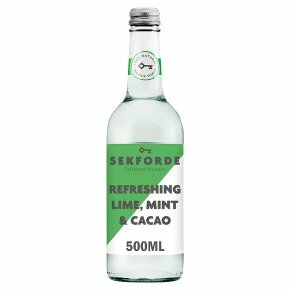 Sekforde bespoke botanical mixers are designed to unlock new flavours in fine spirits. Born in the heart of old London on historic Sekforde St. Tasting Notes: Lime and green herbs give a sophisticated edge to the rounded sweetness of a good rum. The finish is lengthened with Ecuadorian cacao bitters and lifted with a hint of mint. Pressurised container: Avoid damage to bottle or cap. Open with care, covering cap.